Yesterday started like every other Monday morning. Snoozed my alarm as many times as possible before dragging myself out of bed, slapping on some makeup and having a mandatory morning coffee before the work day started. My work day didn't last long. At 9:50am my company sent out a mass email saying there was a threat at Martin Place and not to leave the building. We all heard it was an armed holdup at a cafe and I continued working, not thinking too much of it. In the next 10 minutes the facts started rolling in - guy with a shotgun... Lindt cafe... links to terrorism. My colleague in my small team of 7 has a friend whose son works at Lindt.... But what are the odds that he is rostered on right now? Well apparently higher than we all thought. It is absolutely gut-wrenching to see your colleague so worried about his friend not being able to contact his son (who was one of the 7 that ran out of the cafe at 2am). We abandoned our desks and seated ourselves in front of the tv at work. It was so surreal watching the footage on television - seeing police cars speed past the camera and hearing that same police car siren with your own ears. I was one block away from the Lindt cafe. Tom was right next to the Channel 7 building and opposite the Lindt cafe, watching it all unfold. My Mum works around the corner from Tom. For the first time since I left a poverty-stricken, violent 3rd world country 17 years ago, I feared for my life. Genuinely feared for my life. I haven't felt the same levels of stress and anxiety in a long time. They decided to evacuate Tom's building so he decided to try to get home. My building was still in lockdown but I walked out to join Tom. I definitely didn't want to be separated from him when we were in such close proximity. Some (ok many) people thought it was stupid to catch public transport during such a situation. In retrospect it was actually a good decision as we managed to catch one of the last trains going north before the shut down the harbour bridge. A few colleagues of mine/Tom's were too slow and ended up getting a water taxi to get north of the bridge. Walking to Wynyard station was so eery. Shops were all closed and boarded up. There were very few people walking the streets (mainly tourists who had no idea what was going on). I did see the police handcuff and arrest the man who was apparently in possession of a gun (but unrelated to the siege). The 3-minute train trip home never felt longer. I kept willing the train to arrive safely and I almost ran from the station as I just wanted to be in the relative safety of my home. I sat glued to the telly for the rest of the day. Facebook messages, whatsapp messages and emails came in from worried friends and family in the US and UK. They kept saying they half expect something like that to happen in their country but never in Australia. At 12:30am after 12 hours of television-watching, I couldn't watch anymore and decided to go to bed, dreading what I would wake up to. At 4am I jolted awake. I never wake up mid-sleep. Never ever. But this morning I did. Scrolled through facebook and I immediately sank. I tried to read as much as possible from facebook and twitter but knew there was no way I could go back to bed without watching footage on the telly. And then as soon as I switched the tv on I couldn't tear myself away. Suddenly it was 8am and I had to get ready for work. I felt like I had only gotten ready for work 12 hours before. A minor positive about the day was my colleague's friend's son was safe. Otherwise just a wretched wretched day. I struggled to concentrate. 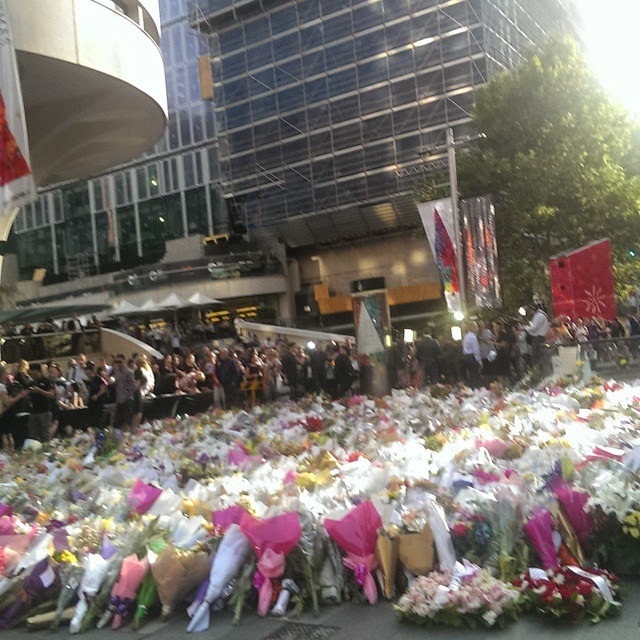 Walking through Martin Place and seeing the flowers, the masses of people there to pay respects, most of them crying, strangers embracing, was definitely not a sight I will forget. Please give your loved ones a cuddle and tell them how much they mean to you. Today is such a sad, sad day in Australia's history but we have had some small victories (#illwalkwithyou) and I know Sydney will heal in time. It was just a heart wrenching day and I struggled too to ge through the day from here until I had made sure all my dear loved ones were safe ad sound and then again until I heard news that the gun man was shot dead. The deaths of the hostages were so sad. And then on Tuesday, the news of Pakistan comes through the media and the day of horror felt all too soon, too familiar. The week has dragged on since, and we are all weary from greiving the tragedy of the innocent lives lost. Completely senseless.